In Reception you will find the children in Violin and Viola classes, you will also meet Mrs Walmsley, Mrs Russmann, Mrs McCallum, Mrs Cookson, Mrs Brown, Miss Latham and Mrs Lear. The children in reception love to learn and we do it best through our play. We always have lots of opportunities to learn whether we are playing indoors or outside. When we start in reception there are lots of things that we can't do...however, we quickly learn a new magic word...YET! "I can't fasten my coat...yet." Thanks to this brilliant word our brains are constantly growing. To find out more about how your child will be assessed during their reception year click here to access the government Development Matters document. For our curriculum theme overview click here. Each half term we produce a newsletter to keep you up to date on what's happening in Reception. Click here to access this half term's newsletter. This half term we will be learning all about mini-beasts. We will have our very own caterpillars, tadpoles and worms to observe and we will be reading lots of mini-beast related stories. On the last day of term we had a special visit from the Easter Bunny. Whilst we were in assembly the Easter Bunny came and hid lots of Easter goodies in our playground. When we came back from assembly we went outside and went egg hunting! It was great fun. Afterwards we went inside and made Easter cones to put our goodies in. Yum! As part of our traditional tales theme this half term, we went on a visit to Tarleton Library. We were able to look at lots of books and heard a story. We found out that if you have a library card you can borrow up to 20 books and take them home for up to 3 weeks. We were very lucky and got to go to visit Hesketh Bank Christian Centre to learn about the Easter story. We helped to act out the story by being disciples and guards; joining in with the last supper,praying in the garden and putting Jesus in jail and then in the tomb. We also played some games, coloured pictures and had a drink and a biscuit. What a lovely way to learn about Easter. We have been working hard all week on poems and pictures ready for our Mother's Day assembly. The assembly started with pictures we had drawn of our mums - they are very realistic...see if you can spot someone you know, or even yourself! We used nice clear voices to read out our work and sang two lovely songs. We finished the assembly by giving our mums a flower. We also learnt about doubles using our numicon again. We learnt a song about doubling and solved some doubling problems. This half term our theme is Traditional Tales. We will be reading lots of different traditional tales over the next few weeks; including The 3 Little Pigs, The Gingerbread Man, The 3 Billy Goats Gruff and Jack and the Beanstalk. Thursday 7th March was World Book Day. We all came to school dressed as a character from a story book and some of us even brought in a book to donate to the school library. We had a wonderful day hearing lots of traditional tales and in the afternoon some of our parents came in to share a story with us. We listened to the story of the 3 Little Pigs and then we used the puppets to act out the story in little groups. We were very good at the voices and the repeated refrains. We decided that the pigs needed a little help building their homes so we had a selection of materials to choose from to build houses for them. The materials included lego, straws, marshmallows, foil, paper and sticks. We could only choose 3 items. We are very proud of our creations! We tested our houses to see if they were wolf and rainproof. We have been learning all about Chinese New Year. We listened to and acted out the story of The Great Race and how the animals were chosen for the Chinese zodiac. We made lanterns, dragon masks and even tried some Chinese food. Tuesday 5th February was Safer Internet Day. In reception we have been learning about what the internet is and how to stay safe online. We had great fun making our own communication system and answering questions about what to do online if unsure. We heard a great story with Buddy the dog, who taught us to 'ask a grown up'. This morning when we woke up it had snowed! Whilst we were busy at work it started to snow again so we got our coats and hats on and rushed outside to enjoy it. We were very lucky to receive a special visit from our local fire engine and fire fighters. We learnt to call 999 in an emergency and how to 'Stop, Drop and Roll' if we were ever in a fire. We all got to sit in the fire engine and use the hose. Some of us even tried on the fire fighter's helmet! We had great fun making and flying our aeroplanes. Over the last two weeks we have been learning about boats. We have talked about the different types of boats and the materials they are made from. In small groups we then designed a boat, made it, tested it and evaluated it. The children were able to say what they liked about their boats and what they would change to improve them. All our boats floated! We asked our children (and parents) to get creative for their homework this week by making a form of transport out of junk modelling. Here are their amazing creations! In our technology lessons we have been learning about some of the parts of a PC such as the mouse, the keyboard and the monitor. We have been practicing our mouse skills through a program called Tizzy's busy week. We received a letter from Mike the Mechanic, his friend Rory the racing car thought that cars go faster down little hills whereas he thought you needed a big hill to go fast. We set up an experiment to see who was right. We made predictions and tested them. We read the story of The Naughty Bus. He gets up to lots of mischief such as driving through dinners, knocking over cups and squeezing toothpaste out of the tube. We made up some of our own adventures for the Naughty Bus and acted them out. Our stories were about being chased by animals, playing in the paint, getting stuck in the mud, a pirate adventure, playing in the dinner and being arrested by the police. As part of our transport theme we have been fortunate enough to have access to balance bikes. Every Tuesday morning this half term we get to practice gliding, balancing, steering and pushing with our feet to improve our cycling skills. We learnt about the Hindu festival of Holi. During the festival people go out into the streets and throw paint and it goes all over them. We threw paint onto paper and it made splatter patterns. It was great fun. As it's our last week in school before breaking up for Christmas we had a Christmas party! We had great fun dancing along to Go Noodle dances; playing games such as corners, Musical statues and musical bumps. We also had a visit from the big man himself - Santa! He came along to say hello to us all and gave all the classes a present. Thank you Santa - see you soon! Christmas Nativity Play - Christmas Counts! This year the reception children and Tiny Treasures put on a performance of the nativity play called 'Christmas Counts'. The children were all wonderful and sang their little hearts out. I think you'll agree that they all looked gorgeous in their costumes! We've been learning about instructions in our literacy lessons and to help us understand them we have been following instructions to make fruit pizzas and jam sandwiches! We had great fun making both, we had to make sure we had everything we needed first, then follow the instructions carefully. We learnt all about how bossy words are used in instructions. We had an Open Morning and invited parents and children to visit our school to see if they would like to be in our Reception class next year. 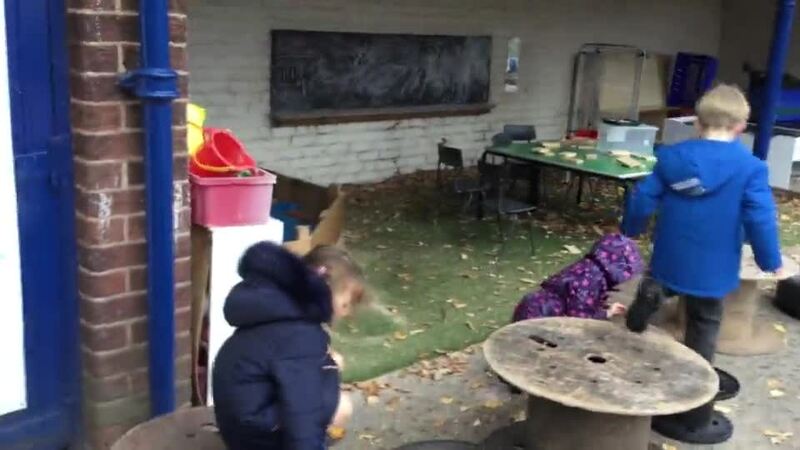 We had to tidy all the leaves in our playground ready and then show everyone how nicely we share and play with each other. Everyone had a fantastic time and we shared with the little children and even let the mummies and daddies join in. To mark the start of anti-bullying week we all wore odd socks for the day - because it's OK to be different! In reception we heard stories about children who wouldn't play with other children because of the colour of their hair, or the clothes they wore...they weren't very nice! We talked about the importance of sharing when playing and not leaving anyone out. We then went of to play nicely together trying hard to remember to share and to be kind. We have been learning about Remembrance day and why we wear poppies. We have made poppies using lots of different materials and media - including painting, drawing, ICT and cutting. We also made a poppy wreath using the hand-prints of everyone within EYFS. As part of our work for Remembrance Day, we looked at some posters from the Second World War. They had slogans on them such as 'Make do and mend' or 'Grow your own'. We talked about the fact there wasn't much food about during the war and people were told not to waste food. We then talked about how there are still lots of starving people in the world and that it was still important not to waste food. We then decided to have a 'clean plate challenge! The parents sent in photographs of clean plates at dinner time and we tried really hard to only take what we would eat at lunchtime in school, and then eat it all up. Take a look at how well we did! Some of the best learning is done through play, and best of all we don't needs lots of expensive toys to do it! Look at what we can do with a few crates, tyres, planks of wood and our imaginations. We used some card and pipe cleaners to make pumpkins today! We had to concentrate really hard to do the threading, but we were really proud of the finished results. On Friday 19th October we went on our very own Countryfile Ramble. All the children from KS1 and EYFS took part in this annual event. Thank you to all the parents and grandparents who came to help. We will let you know how much money we managed to raise once we've collected it all in. We explored our sense of smell by wearing a blindfold and trying to guess what things were in the cups. We got to smell orange, banana, mints, vinegar and cheese and onion crisps. The crisps were very tricky to identify. As part of our Ourselves theme we've been learning about our senses. We made giant listening ears and then played listening bingo. We had to identify lots of different sounds such as a microwave, a phone, coins in a tin and a doorbell. We started school on Wednesday 5th September. We all looked very lovely in our brand new school uniforms. Take a look at our pictures and see for yourself! In our first week at school the Lancashire Evening Post came to take our photograph and put us in the paper. We think we looked very smart. On 26th September we had a very special visitor to our class. Baby Deia came to see us, she was only 8 weeks old. We talked about how we have changed from when we were babies to now. We asked Deia's mummy lots of questions and found out that she can't walk or talk, she needs help to feed and change her nappy and she is very wiggly.